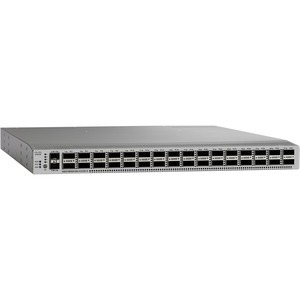 The Cisco Nexus® 3232C Switch is a dense, high-performance, power-efficient, 100-Gbps switch designed for the data center. This compact, 1-rack-unit (1RU) model offers wire-rate Layer 2 and 3 switching on all ports. It is a member of the Cisco Nexus 3200 platform and runs the industry-leading Cisco® NX-OS Software operating system, providing customers with comprehensive features and functions that are widely deployed. The comprehensive programmability features help enable organizations to run today's applications while also preparing them for demanding and changing application needs such as big data, cloud, and virtualization. The Cisco Nexus 3232C supports both forward and reverse (port-side exhaust and port-side intake) airflow schemes with AC and DC power inputs.